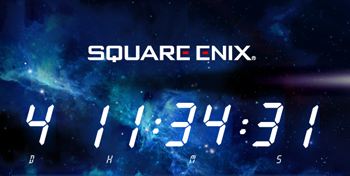 Square Enix's latest countdown clock is set to reveal a new game on December 11. Square Enix loves countdown clocks, and the publisher has set up another one that's currently ticking down the seconds until a new game is announced. The clock is prominently displayed on an accompanying teaser site, which features a starry space background, some planets, oh, and the word "star" in the upper right-hand corner. Could this be hinting at a new Star Ocean game? For fans of Square Enix's long-running RPG series (no, not Final Fantasy or Dragon Quest--the one in space), it's been nearly four years since Star Ocean: The Last Hope was released. There's not a lot to go by on the teaser site, but the hints seem to point at something Star Ocean-related, even if it's not necessarily the next entry in the franchise. The URL even contains the word "liftoff," with the page called "Secret Title 2012.12.12."